Spirit from Jacksonville State University has announced a reorganization of the corps' administration effective for the upcoming 2008 season. Current executive director, Ken Bodiford, has accepted a new position with Spirit as director of education. 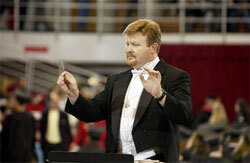 This position will allow Bodiford the opportunity to pursue his doctorate in wind ensemble conducting this next season. He will serve as a member of the Spirit Board of Directors and will help oversee the educational foundations of the corps membership. Bodiford's prior duties will be split between two current staff members who are being promoted into new roles of greater responsibility. Read more on SpiritDrumCorps.org.